The City of London's 1297 copy of the Magna Carta has travelled through the capital during the Lord Mayor's Show. The document of basic rights is seen as the cornerstone of constitutional law. Alan Yarrow, the new Lord Mayor Of London and Fiona Woolf, the previous Lord Mayor, waved at the crowd during the celebrations, which also featured 180 horses, penguins and a Chinese dragon. Ms Woolf was just the second woman appointed to the position in almost 800 years. Members of the armed forces dressed in World War One uniforms to mark the centenary of the the start of the war. The procession began on the River Thames, with the Lord Mayor boarding the QRB Gloriana, the Queen's vessel during the Diamond Jubilee Pageant, and leading a flotilla of traditional barges and small boats up the river from Vauxhall to HMS President at St Katharine Docks. 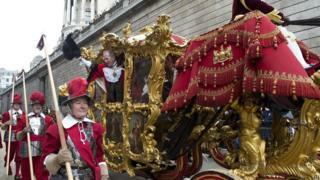 The Lord Mayor's Show began in 1215 as a River Pageant on the Thames. The show continued on the Thames for 400 years until the Corporation of London handed over responsibility for the tidal Thames to the Thames Conservancy in 1857.